Between the great Despoblado (Uninhabited Land) of the Atacama and the Aconcagua Valley of Central Chile lie the watersheds of Copiapó, Huasco, Elqui, Limarí and Choapa. In 1535, this zone was inhabited by the Copiapo and Diaguita people, who numbered around 25,000. In the valleys, these groups grew potatoes, quinoa, corn, beans and many other vegetables, which they watered from irrigation canals they had constructed. They also grew cotton, specifically in the Copiapó and Huasco valleys, and gathered wild plants, hunted and fished. Their members included skilled potters, weavers and camelid herdsmen; others engaged in sophisticated metallurgical processes to produce gold, silver, copper and bronze. They lived in villages and pukaras (forts)—the former in times of peace, the latter in times of war—where they had storehouses or silos that enabled them to preserve and store provisions. In sociopolitical terms, they were divided into two segments: one that occupied the upper and middle reaches of each valley, another living on the coast and in the lower valleys; each was led by a kuraka (head chief). In each valley the segments engaged in rivalry and competed with each other, but they also cooperated. In effect, each valley had two sets of leaders who established political, economic and ritual relations with each other. Despite having similar ways of life, the inhabitants of different valleys had their own distinct cultures and language; they also bore the marks of their incorporation into the Inca Empire of Tawantinsuyu. 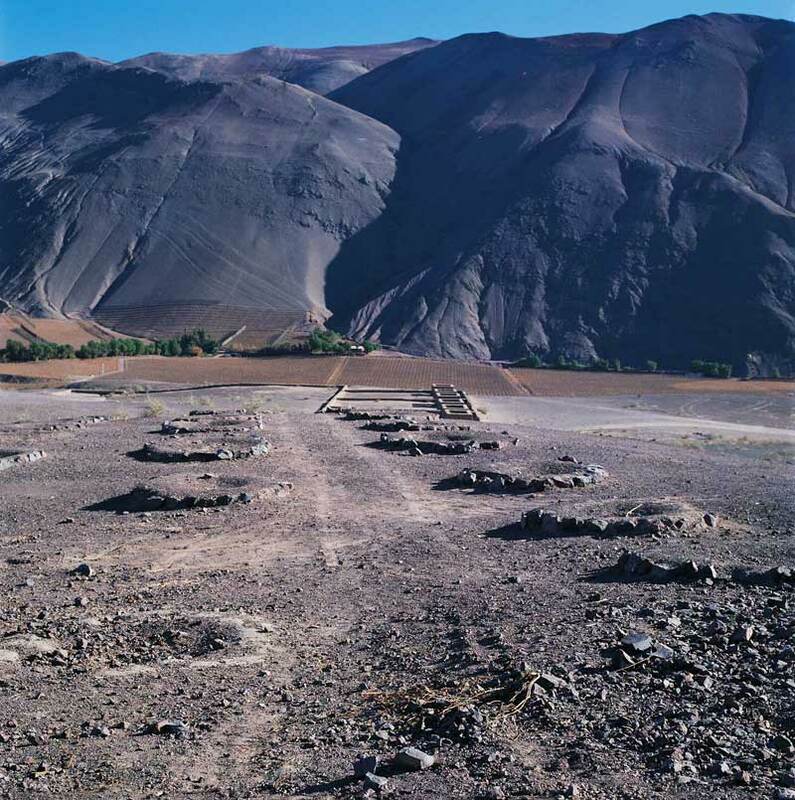 The Incas annexed valleys such as Copiapó for their agricultural and mineral potential and built a road network complete with trails and tambos (waystations), redistributed the land, improved local irrigation techniques and introduced new architectural forms. Additionally, they constructed metallurgical centers, introduced new ritual elements and made other cultural changes. The new rulers brought their own officials from Cuzco, along with soldiers and mitimaes (groups of foreign laborers), and established relations with local leaders. They also brought the Quechua language. In 1540 the region’s native population numbered around 20,000, but by 1545 it had dropped sharply to around 10,900. What happened? What role did the transverse valley zone play in the conquest of the Kingdom of Chile? For one thing, these valleys, especially the Copiapó, were unlike the surrounding landscape, which included the Andes Mountains on one side and the desolate Atacama Desert on the other. That valley had abundant water and a wealth of other resources, suitable for resting and gathering strength before the long march south—for those arriving from the Atacama or heading for Tucumán, in Argentina, across the mountains—or to the Arid North, where again the Uninhabited Atacama was a natural barrier that travelers had to deal with. Its features and location made this valley a kind of natural frontier, and the head the valley was considered to be the northern border of the Kingdom of Chile. In the early years of the conquest, the transverse valleys were looked upon as a land inhabited by “aggressive, warlike” indigenous groups whose leaders banded together to kill Christians and resist the coming of the Spanish hosts. In April 1536, Diego de Almagro reached the Copiapó Valley after having spent nearly 9 months traveling through the rocky hills, plains, valleys and desert of what are now Peru, western Bolivia and northwest Argentina, following one of the branches of the Qhapaq Ñan, the great Inca Road. His journey had been undertaken in stages, with periods of rest and provisioning, timed to prevent snow and wind storms from hindering the advance of the expeditionary force. The force included the Spaniards themselves, local interpreters such as Paullo Tupac, a relative of Inka Guascar, yanaconas (indigenous servants), African slaves, and horses. The host descended into the ‘Copayapu’ valley after crossing the mountains over what is known today as the San Francisco pass. Almagro dispatched a small band to perform reconnaissance and advance to the south, but these men were murdered in the Huasco Valley. In Copiapó the local chiefs, warned by advance messengers sent by Paullo Tupac, awaited Almagro in peace and with sufficient provisions. However, Almagro became incensed when he received news of the murder of his men in Huasco Valley, and in retaliation he had one of the local Copayapu chiefs put to death. The host continued its journey and reached that valley, where the indigenous inhabitants received them in peace, though they soon fled from their villages. Upon their arrival in the Quimbo or Coquimbo Valley, the Spaniards further learned that the murder of the advance party had been planned some time before at an assembly of local chiefs. Almagro’s response was brutal. He arrested around 30 chiefs from the Huasco and Coquimbo valleys then called for posts to be erected and burned these local dignitaries alive. The conquistador then continued his journey southward. Near the present-day town of Los Vilos, he received news that the vessel El Santiago, under the command of Alonso de Quinteros, had reached the coast nearby, bringing food, weapons, clothing and iron in support of his enterprise. Thus provisioned, Almagro reached the Aconcagua Valley. Some months later, in August, he decided to abandon his conquest of the valleys of central Chile and return to Peru. His reasons included the lack of gold, which he had expected to find in this region, the news of an indigenous uprising in Peru, which threatened the conquest of the Andes, and his ongoing struggle with the Pizarros. In October 1540, several months after departing from Cuzco, Pedro de Valdivia reached Copiapó and took possession of the territory of Chile in the name of God and the Spanish Crown. The host had crossed southern Peru, the coastal plains and the Tarapacá and Atacama basins then had continued their journey through the Uninhabited Atacama until reaching the Chañar Valley (south of the present-day locality of Diego de Almagro), finally reaching the Copiapó Valley. There, the expedition obtained not only provisions but also information about the local chiefs, Aldequín and Guanelica. The indigenous people fled as they approached, and Valdivia decided to attack them at the fort where they had taken refuge. Scores of men were killed and many women and children were taken prisoner. Valdivia knew that containing the indigenous resistance would be a difficult task. Following in the footsteps of Almagro, he continued on to the valleys of central Chile and proceeded to found the city of Santiago. Shortly thereafter, it would be destroyed in an attack by Chief Michimalonko, aided by the indigenous inhabitants of the Copiapó and Atacama valleys. In 1544, Valdivia sent Juan Bohón to “populate and hold” the mouth of the Elqui River. He founded the city of La Serena and established the first encomiendas (a kind of feudal landhold) of La Serena and Copiapó. He also founded Bohón Fort, also named Copiapó. The indigenous uprising of 1548–1549 marked a milestone for Spanish control of the area. Francisco de Aguirre rebuilt the city of La Serena and was able to keep the armed conflict in the surrounding valleys, away from the city. Juan Bohón died in Copiapó and Aguirre inherited his land and indigenous servants. This period marked the initial occupation of indigenous lands along the coastal and middle reaches of the region’s valleys and the relocation of their inhabitants to “Indian towns” and ecclesiastical missions. It also witnessed the use of indigenous labor for agricultural, mining and livestock operations, the establishment of ranches and agricultural estates, and the emergence of new authority figures. These changes impacted local indigenous societies, which had to find ways of adapting to this new reality to maintain the continuity of their culture while serving as miners, laborers, craftspeople and herdsmen in the 17th century. Some indigenous people were relocated to ranches and estates in other encomiendas, which led to the fragmentation of some communities, though a few groups managed to preserve a portion of their original lands and organization. As we look at the inhabitants of that geography, we may ask ourselves: What would happen if we went exploring into the past and present of these valleys and their settlements? Would we find other threads of the story?